Let’s say there is a list of dates and a list of values. You can easily sum them up with the SUM function. It becomes more complicated if you want to sum values in the range that is between two selected dates. Use this formula to sum values between two ranges and insert it into a cell E4. This is the SUMIF function that sums values if they met the specified criteria. 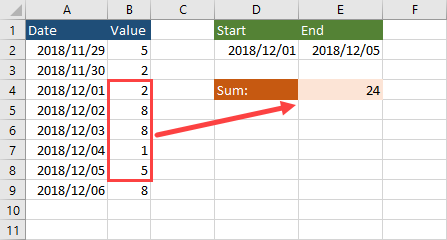 The formula will sum up all the values between two dates. B2:B9 – The function takes all the values as the first parameter. A2:A9 – The function takes all the dates as the second parameter. “>=”&D2 – The first criterion. The start date. The function will start summing up from this date. That’s why you have greater or equal. Every date before this one will be omitted. “<=”&E2 – The first criterion. The end date. The function will end summing up to this date. Every date after this one will be omitted. The function will sum up values between B4 and B8.